Moab - Would you like to give ice fishing a try, but you're not sure how to get started? 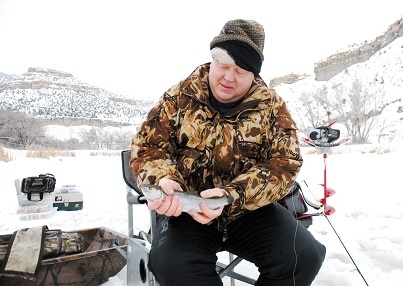 You can learn the basics at a free ice fishing clinic in Moab. If weather and ice conditions permit, the clinic will include a fishing trip to Ken's Lake where you can give your newly learned skills a try. The Division of Wildlife Resources is sponsoring the free clinic. It will be held Feb. 3 at the Grand Center, 182 N. 500 W. The clinic runs from 10 a.m. to 11:30 a.m.
After the classroom instruction, if the ice at Ken's Lake is safe, the DWR will host a fishing trip to the lake. (The ice needs to be at least four inches thick.) Fishing will start at 1 p.m.
Those who attend the event will learn about staying warm and comfortable on the ice, how to be safe on the ice, fishing gear and bait that work best for ice fishing, and how and where to drill a hole. After teaching the basics, clinic instructors will share advanced tips and tricks for some of the best ice fishing destinations in southeastern Utah. The event is free, but if you want to fish at Ken's Lake, you must have a current fishing license. You can buy one at a DWR regional office, online at wildlife.utah.gov, or at most sporting goods stores. If you don't have your own fishing equipment, no problem-the DWR will loan you the gear you need to fish at Ken's Lake that day. Walt Maldonado, regional wildlife recreation specialist for the DWR, says the clinic is for everyone, regardless of age or experience. "If you've never been ice fishing," Maldonado says, "this clinic will give you the confidence you need to get started with a hobby you'll look forward to every winter." If you have questions about the clinic and fishing trip, call the DWR's Southeastern Region office at 435-613-3700 or Walt Maldonado at 435-820-8147.